This was a request for Wall*E. And what makes this figurine great is that it doesn't come in a plastic package that'll end up in a land-fill. my wife was swooning when I showed here this post. As you have posted some of the more recent pieces that you've done, I keep meaning to ask you what you charge for them? Send me an email if you'd rather. I might be interested in having you create something for me. stephen - glad your wife liked it! As for pricing, I have a basic price scheme I used for my standard stick-figure pieces, and for more complex figurines (like this one), I charge based on how long I think it'll take me to make it. I'll shoot you an e-mail. Holy crap dude, this stuff is amazing. Now i really want a wall e how big is it and can you email me a price? 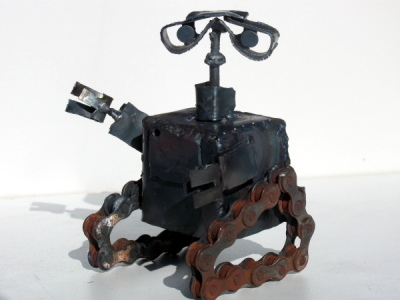 This wall*e is about 5" tall. I've sent you an e-mail with a price. Can you email me a price of this ?